John Shelley paints the English countryside in a beautiful and almost surrealist style. 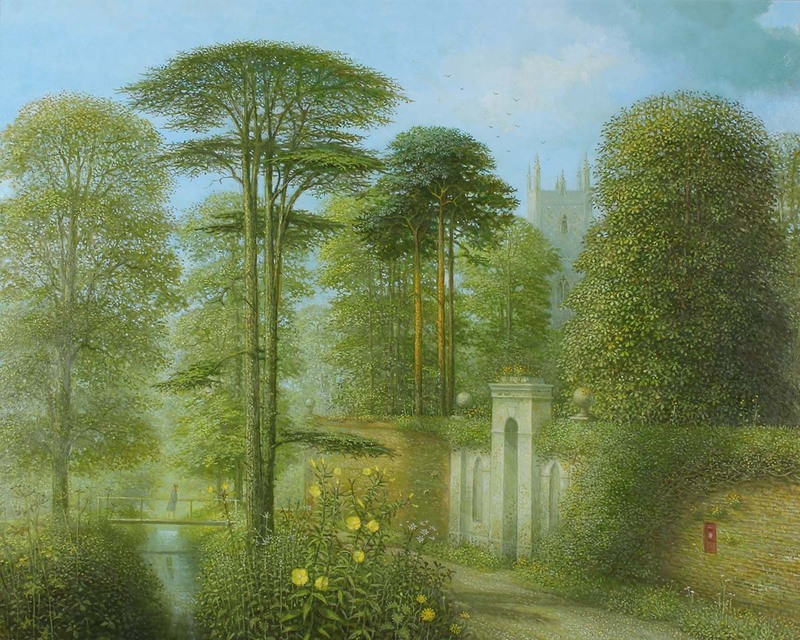 John paints from his imagination while being inspired by the pastoral English countryside these dreamlike landscapes are created from fantasy. John was born in Margate in 1938 and soon moved to Surrey. He went to Wimbledon Art School in 1953 where he studies painting, before going on to the Slade School in 1958. Here he met Anthony Gross who taught him etching. In 1960 John was called up for National Service with the RAF and soon married, his wife encouraged him in painting, he submitted and was accepted to the RA Summer Show in 1968 where his painting sold immediately. From this point, his painting career began. He had more works accepted in the RA, one of which was purchased by the Tate and ope purchased by the Contemporary Arts Society. He began showing with the Trafford Gallery in Mount Street and with Mandell’s Gallery, Norwich. John Shelley’s greatest influences are Samuel Palmer and Stanley Spencer. As for subject matter there are many recurring motifs topiary, old mills, lattice windowed cottages, enchanting leafy lanes, old stone pillars, masonry with creeping moss and towering trees.